Arrows show direction of wind shear. 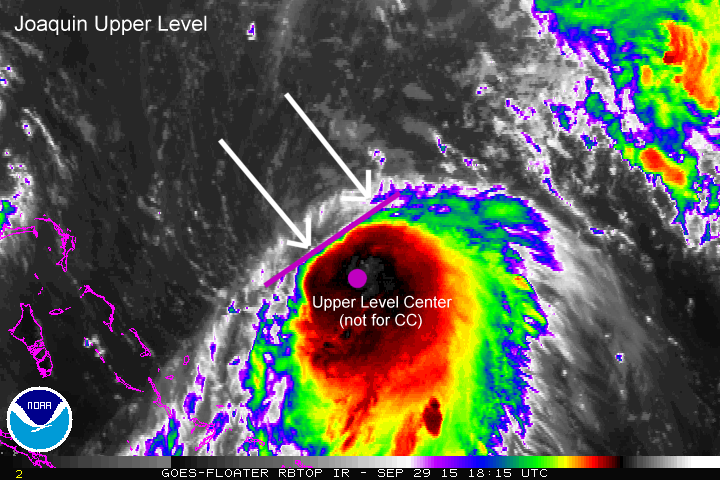 As you can see, the low-level center is displaced to the northwest of the center of cold cloud. The distance of this displacement is related to the strength of the storm winds, which is why we ask you this when you are performing a shear classification. It would not be correct to choose the middle of the cold clouds as the center of the storm – the magenta dot above shows where the middle/upper level circulation center is. In essence, the storm is being vertically deformed by the strong environmental winds – the more deformed, the weaker the winds. Now that you are an expert, head on over the Cyclone Center and see if you can find a few shear storm examples of your own!